I posted back in August how a bird's nest had fallen from one of our big Oak trees down to the yard and how the kids were fascinated by it. 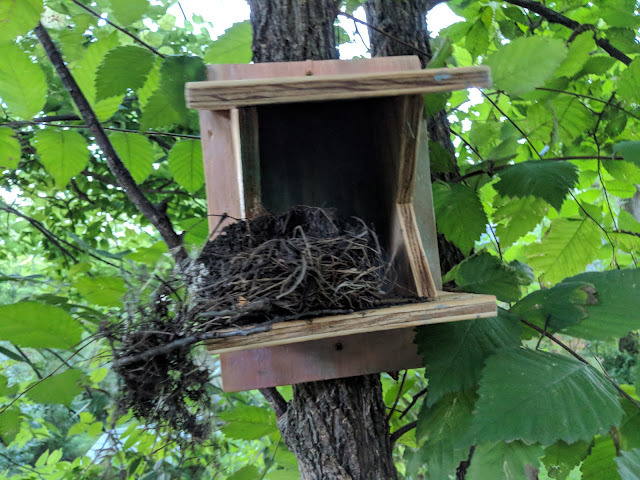 I read up a bit and figured out that we could build a nesting platform for both the replacing of *this* nest and hopefully the usage of other birds (Robins?) next season. I found these easy plans for a nesting platform/shelf here. I had 1/2" plywood on hand, so I decided to use that. I know that Cedar would be better, but I had the plywood on hand. I made the cuts, assembled the thing and even tweaked it a bit. I added a series of drainage holes to the bottom of the platform and to the bottom/sides of the walls. Figured for both drainage and airflow. After I built it, I had the Bird paint it. You can kind of see that she used some metallic paints on the back/sides of it. After I asked her if she wanted to finish it, she insisted that it was done. So, I put down a few coats of spray-on clear coat to both protect her paint job and to give the plywood a slightly longer life than it would have on it's own. After drying, I tacked it to the trunk of a tree about eight feet above ground-level all the way in the back of our property. 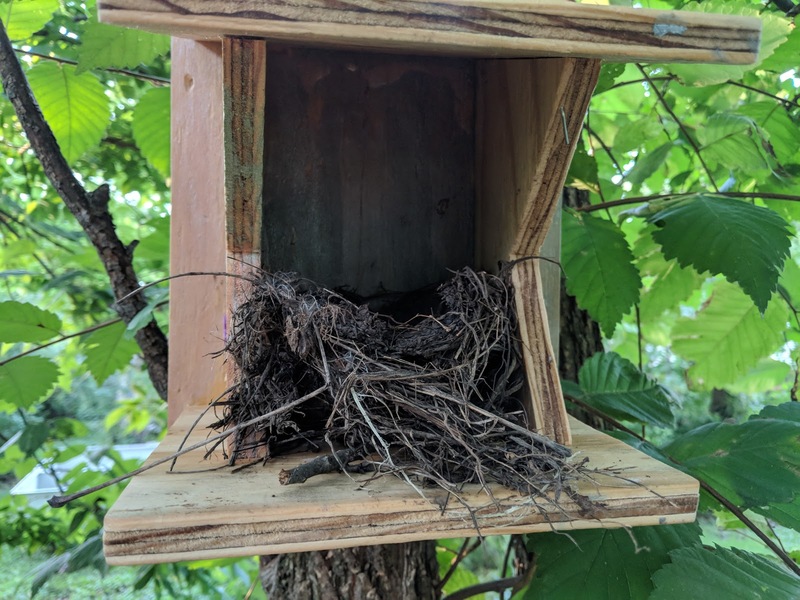 I stuck the existing nest on there in hopes that it would either be re-used or built on top of, but I figured that this season was lost. You can see the nest above in the photo on installation day. Below is a photo I took a few days later. As I said, this was put up about eight feet, so it is hard to get a good shot without a ladder. So, pardon the angled photo. Trust me, this is hung perfectly straight and level. But, notice the disturbance in the nest material. And the twig that has been dragged out from underneath the nest. Is someone attempting to make a home? Trying to utilize some of the materials for a nest in a different location? Or some predator ransacking the place looking for eggs? I have no idea, but now that we have this nesting platform, I'll be watching the changes with the seasons.